When trying to decide on the next acrylic painting how-to post to write, I made a ginormous list of all of the things I could write about and realised that colour mixing made up about 80% of it. Colour mixing is the one thing I obsess about more than anything else. I know it’s something I spend a lot more time and energy on than most artists – I can tell by the crazy looks they give me – so it’s also the thing I have the most to prattle on about. Something I spend a lot of time experimenting with is muting bright colours. There are a lot of different ways to desaturate a colour. What I’ve learnt is that you really need to familiarise yourself with all of the different techniques for desaturation so you can decide which method is best in each particular case. The first technique we’re going to look at is using natural iron oxide paints to de-saturate bright colours. I say “natural” but in reality iron oxide paints can be synthetic as well. All of my iron oxide paints are natural except for Raw Sienna. The chart below shows you the effect the five most common iron oxide paints have on bright colours. The five iron oxide colours are represented by the first column. The five bright colours I’m using are represented by the first row. I’ve then mixed each iron oxide colour with each bright colour, so the second row is each bright colour mixed with Raw umber, the third row is each bright colour mixed with Burnt Umber, and so on. You may have noticed some of the colour swatches have smaller squares in the top right corner – they’re tints of the same colour to make it easier to see the hue. 1. It looks like the Raw Sienna and Yellow Ochre are virtually the same colour – and they pretty much are – but something that you can’t see in this photo is the glossiness of the paints. The Raw Sienna is glossy whilst the Yellow Ochre is matte. In fact, all of the iron oxide paints, except Raw Sienna, are matte and all of the the bright coloured paints along the top are glossy. Also Yellow Ochre is a bit more opaque. 2. As you can see, it matters a great deal which iron oxide colour you choose to use. 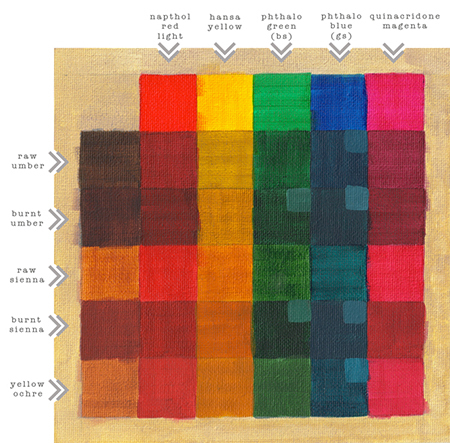 Not all iron oxide paints will desaturate all bright colours equally or in the same way. The iron oxide paints that will desaturate your colour the most are those whose colour bias is closest to the complimentary colour of the colour you’re trying to subdue (more on colour bias below). 3. Often, using an iron oxide paint to desaturate a colour will result in a significant hue-shift. For example, in comparison with the straight Hansa Yellow Medium the Sienna and Yellow Ochre mixes look very orange. 4. Unless the values agree, desaturating with iron oxide paints will also shift the value (lightness or darkness). I had to add a bit of white to many of the Umber mixtures as they were so dark it was difficult to see the hue. 5. Keep tinting strength in mind, especially when working with the weakest and strongest tinters. As a general rule, you’ll never need much red-based paint to shift yellow so go easy with the burnt iron oxides. Conversely, the yellow-based iron oxide paints don’t have much tinting strength compared to reds and Phthaloes. 6. Most of these colours I’d de-saturate even more. Depending on what I was trying to achieve I might add more of the same iron oxide colour or I might add a second, or I’d combine this desaturation technique with another one. 1. Raw Umber – A dark greenish brown. Because of its green bias, Raw Umber will have an excellent desaturating effect on magentas (green’s compliment). Also, the cool undertone of Raw Umber makes it the best choice for muting yellow without pushing it towards orange the way the red and orange biased iron oxide pigments do. 2. Burnt Umber – Heated Raw Umber which transforms it from a dark greenish brown to a dark brown with a hint of red tones. Burnt Umber seems to work equally well for desaturating all of these bright pigments. 3. Raw Sienna – A yellow-brown colour with an orange bias. The orange bias of Raw Sienna makes it a good choice for muting blues but it will give blues a green tinge. Even when mixed with its complimentary, it has quite a subtle desaturation effect and I think its biggest influence is on the warmth of the colour – it will make cool colours warmer. 4. Burnt Sienna – After roasting in a furnace Sienna becomes a reddish-brown pigment. As mentioned with Raw Sienna, anything with an orange or red bias will be a good choice for muting blue. 5. Yellow Ochre – Has the same colour mixing properties as Raw Sienna with the benefit of a matte finish and slightly more opacity. Yellow Ochre seems to be a better choice for muting blues than Raw Sienna if you want less of a green tinge to your blue.